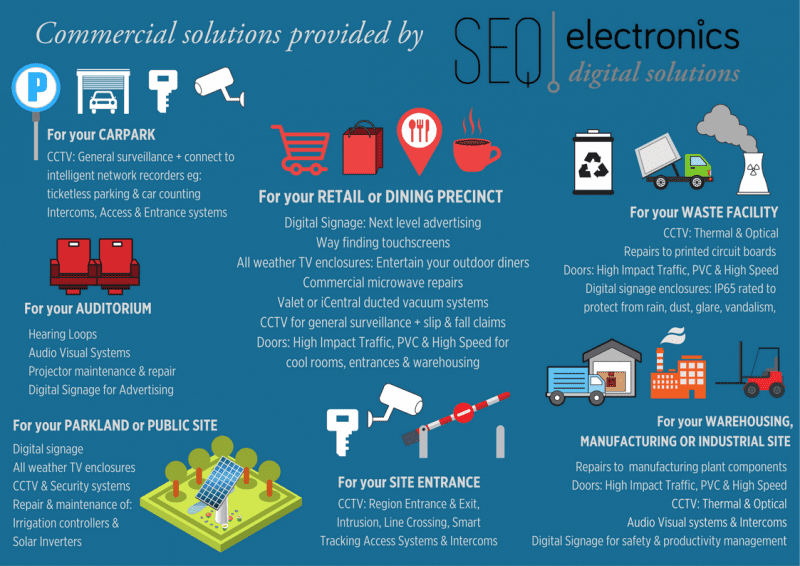 SEQ Electronics & Entrance Systems is a dynamic, responsive solutions-based electronics company with a broad range of electronic expertise. SEQ Electronics & Entrance Systems has been operating continuously since 1994. We are an Australian, family owned company operating from a spacious workshop and warehouse in Capalaba, Queensland. Since starting off in Audio Visual repairs, our business has exploded to become one of the largest Suppliers, Designers, Installers, Integrators, Automators, Repairers and Servicers of Electronic and Digital Solutions in South East Queensland. We operate in the domestic, commercial, education and industrial arenas. Where do we hold Expertise and Licenses? We seek electronic solutions for you, and we are not limited to one Brand, product or method. We source electronic products and parts, and digital systems globally and locally. If it’s a more efficient solution, we repair yours items or make our own boards! Our nationally recognised award winning customer service values understanding your problem, devising solutions, accommodating your schedule (day and night), applying our technical expertise, communicating the progress and successfully delivering on time and on budget. We have applied our electronic expertise to clients from domestic electronic users in homes and apartments, to many satisfied companies. We service all areas of the Greater Brisbane region; from Caboolture in the North, to the Tweed Coast in South; Ipswich in the west, to Redlands in the East. 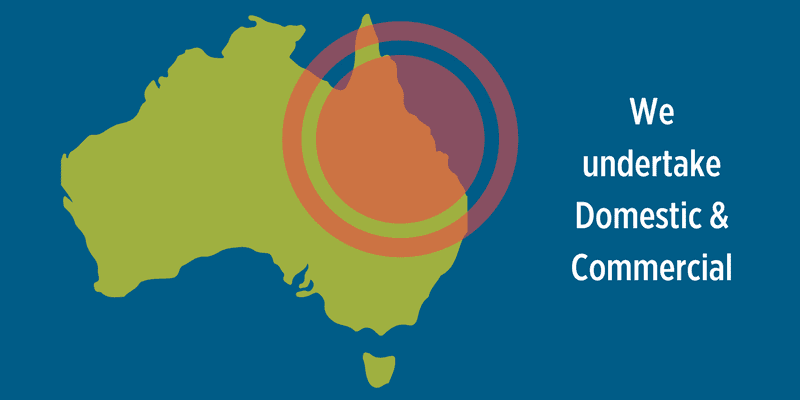 We travel further afield for bigger projects, particularly Far North Queensland and NSW. We can supply Manufacturers with a Postcode list for convenience and calculation. In addition to our South-side workshop, we operate 4 large vans for in-home and on-site deliveries, installations and service. Our Technicians repair down to component level on circuit boards, saving you precious time and money on unique or difficult failures of expensive line equipment. We have a 3-phase Technician to solve your heavy-duty electronic issues. Every member of our team is experienced, and Government Accredited and Licensed in all relevant areas – from construction sites to secure facilities. Our Field Technicians also have National Police clearance, allowing us access to special facilities. You, and your Tenants, Aged Care Residents, Patients, Staff, Customers and Students are in safe hands with SEQ Electronics & Entrance Systems. 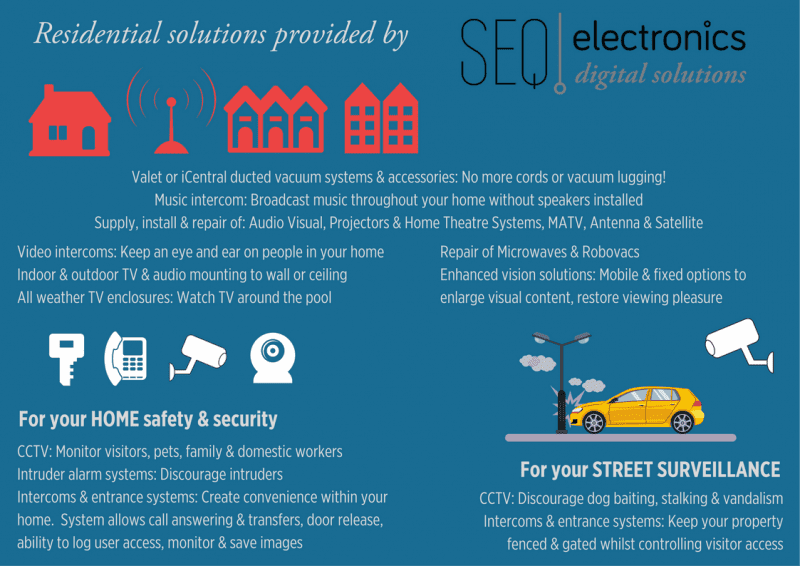 SEQ Electronics & Entrance Systems is a leading supplier, repairer, installer and integrator of all Audio Visual equipment inside and outside your home. We also repair Robovacs, Microwaves and Solar Inverters – (allowing you to retain your profitable electricity rating). We can simplify your lifestyle by providing Electronic Security and Access Systems, Intercoms, and Valet Ducted Vacuum Systems. What are our National Customer Service Awards ?